I admit it: among the things I generally tend to poo poo are cake toppers. Honestly, I had never really found any that I thought were really cute – and then I found Lollipop Workshop a few weeks back. I’m not sure what it is about them – the sweet simplicity of the bride and groom’s style, the cute and sometimes whimsical terrains they’re put on, or how incredibly detailed they are in the customizability. They’re just utterly endearing. Check out their Etsy shop here for other pieces they’ve done to get a better sense of their seemingly unlimited range of options. I’m a huge fan of the lollipop toppers too. They’re adorable but not treacly. I agree! Never a huge fan of cake toppers but these take the cake! (I’m sorry I couldn’t resist!!) Adorable! I love them! Look at all the details, so delicate! 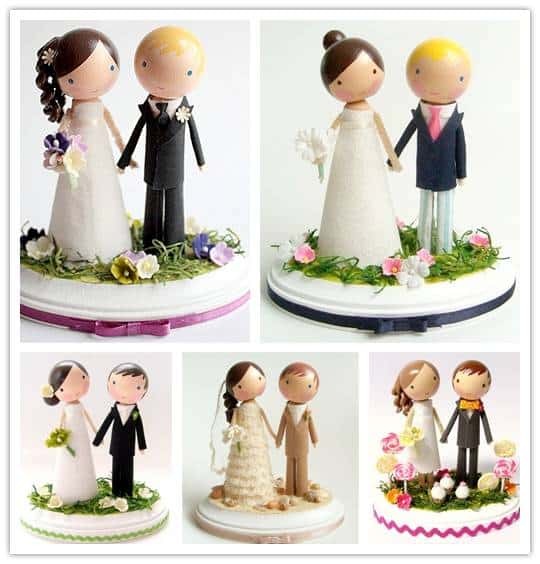 I just love these custom cake toppers — if they were available when I was getting married a few years ago, I would have definitely bought some! I’m considering this shop for my topper! love all the little details! Aww, these are indeed very cute! Oh my goodness – now these really are super cute wedding toppers! Have you seen the ones on etsy made of paper – not so much in the cute bracket, but very impressive artwork!